No matter where you are from; if you are arrested and detained in the Laguna Beach Jail you will need a local bail bondsman. Our agents are ready to meet you at the Laguna Beach jail, to get you, immediately. To locate your loved one or to find out the crimes with which they have been charged; please call us at 949-494-4243. 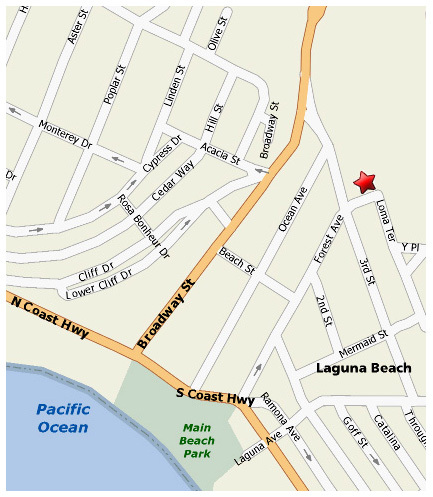 The Laguna Beach Jail is located at 505 Forrest Ave. Laguna Beach, CA 92651. Upon posting of the bond; the release time from the jail is usually 20 to 30 minutes. If bail is not posted at the Laguna Beach Jail; often the inmates are transferred to the Orange County Main Jail located directly across the street from our Santa Ana office. The release time at OCJ is usually 4 to 6 hours. Parking is always a problem in the downtown area. There are two green spaces in front of the Police Department on Loma. If taken, turn around and turn right onto Forest. Check in front of City Hall otherwise you will have to search for an open space. Take State Route 133 toward Laguna Beach. After you pass the Festival of Arts, turn left at Forest Avenue. Turn left at the stop sign, Loma Place. The entrance to the Police Department is on your left. Turn onto Broadway from Coast Highway. Broadway intersects with Main Beach Park and is a major intersection with two gas stations on both inland corners. Take Broadway to Forest Avenue and turn right. Turn left at the stop sign, Loma Place. The entrance to the Police Department is on your left.